Many others and myself spent most of our anti-Dads discourse on the social failings of the show. That aspect is vital, of course, when looking at a program that tries to sell its narrow-mindedness as progression. But looking at the show simply from the perspective of television also causes it to fall flat, especially within the context of the multi-camera sitcom. That genre has been suffering for a while now, offering up the occasional success like How I Met Your Mother, but severely lacking a majority of the time. It’s not that the format itself is unusable in our modern world. Rather, creators have forgotten what to do within the multi-cam sitcom, and suffer accordingly. I’ll use, as a case study of multi-cam sitcoms of yore, Cheers, easily one of the crowning achievements in this category. How I Met Your Mother, while fitting the mold, diverges in its lack of a live studio audience and freewheeling use of unique editing choices. Cheers is a pinnacle of the stripped-down format we’re discussing, and, vitally, would not have worked the same way as a single-camera comedy. The content it produced depended on not just the energy of a live audience, but the staging inherent in multi-cams. One of that show’s greatest moments came at the end of its second season. Sam and Diane have yet another fight, but this argument goes places that previous squabbles only hinted at. In a single scene the show gets across the fear, fury and humor of this type of lovers quarrel. And it does so by ebbing and flowing, using the firecracker of physical comedy to climax a scene before settling on a quiet, profound moment (Sam’s “wow”, one of the greatest line deliveries in television history). Now, that sort of pacing can be done anywhere, but it is the specific energy of the multi-cam that informs this piece. In order to hook both the audience at home and in the studio, the actors have to perform more loudly than they would with a camera directly in their face. This can lead to broader comedy (I do not mean that derisively), and capturing the energy in a specific way. Then, most importantly, when the scene calms down for the final moment, that quietness speaks volumes. That is just one of the many pros with the multi-cam: given that the reality is more heightened, as these are actors on a stage, there are unique ways to play within the given room. It seems that many multi-cams today think the format simply means that they get to tell you when to laugh. A couple of clarifications: I don’t mean to say that all old multi-cams knew how to use that staging. 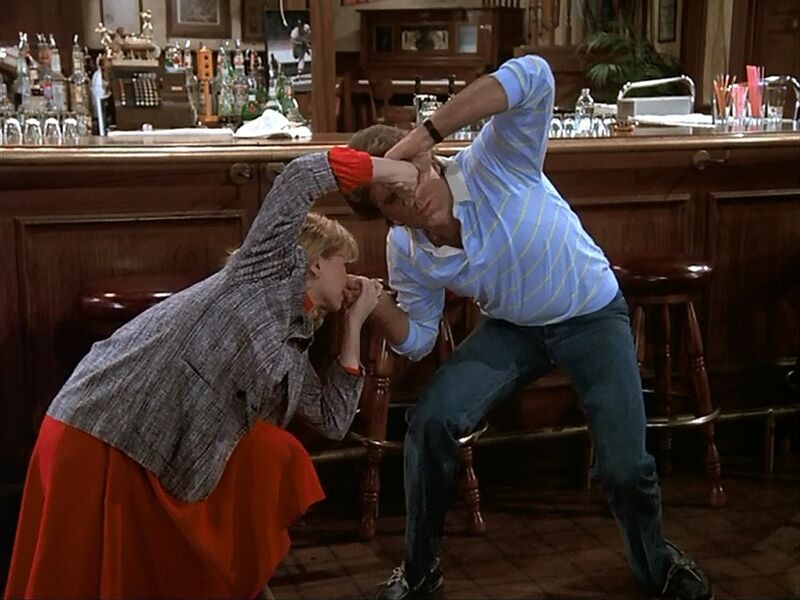 And I don’t mean to say that a show stopping scene such as the Sam & Diane fight is the only way to utilize the multi-cam. Rather, on that second point, the micro proves the macro. The specific room of the format, both the literal lack of a fourth wall and the use of more stage-like blocking, allowed an energy that caused that type of scene. But it’s that energy that’s important, and what’s lacking in something like 2 Broke Girls or Dads. These shows lack an understanding of what they can do given their surroundings. Dads seems to think that all the format means is that Seth Green and Giovanni Ribisi should mug as much as possible (oh good lord, they should not). The pilot of episode of Dads coasts on a single tone. Even when it goes for a somber moment it plays at the same volume, never exploring the spaces it’s been offered. There’s too much of one thing, and when that constant is pushed, the content suffers. There is a similar problem with 2 Broke Girls. That show freaks out at the prospect of dynamics. Even something like The Cosby Show, which didn’t go for the dramatic darkness of Cheers, knew how to differentiate between moments. A single-camera show can stand to hold a tone because the camera defines the space in which the show operates. In a multi-cam, the actors create that space, so there’s more reliance on them doing something with it. If they stick to one tone, they miss out on what the stage affords them. The multi-camera sitcom isn’t dead, but it is becoming lost. Not because it’s an intrinsically faulty art form, but because many have forgotten that it’s an art form at all.